Addresses at the Dinner in Honour of the Bishop of New York (The Rt. Rev. William Thomas Manning) given by The Church Club of New York on Monday, the Sixteenth of May, 1921 at the Waldorf-Astoria. [New York:] no publisher, 1921. The Policy of Trinity Parish. A Sermon Preached in Trinity Church, New York on Low Sunday, April 18th, 1909. Sermon by the Rev. Dr. Manning Preached at the Church of the Ascension, Mount Vernon, New York, to a Congregation of Combined Men's Clubs, February 4th, 1912. From The Great Commission: A monthly publication of The Cathedral League of the Diocese of New York, Volume 1, Number 5, March 1912. New York: No publisher, 1909. The Protestant Episcopal Church and Christian Unity. New York: Edwin S. Gorham, Publisher, 1915. A Pre-Lenten Sermon Preached in Trinity Church, New York on Septuagesima Sunday February 16, 1919. Extracted from The Trinity Parish Record Vol. VI. No. 5. New York, February 1919. The Fifth Synod of the Province of Washington. Sermon at Opening Service. No place: The Synod of the Province of Washington, 1920. Sermon Preached by the Right Reverend William Thomas Manning Bishop of New York in the Cathedral of St. John the Divine on St. John the Evangelist Day, 1921 at the Dedication of the Founder's Tomb Erected as a Memorial To Right Reverend Horatio Potter Sixth Bishop of New York. Jesus Christ the Same, Yesterday, and To-Day, and Forever: Sermon at the One Hundredth Anniversary of St. Thomas's Church, New York, on the First Sunday in Advent, December 2, 1923. From the Sermon at the Consecration of the Right Reverend James Edward Freeman, D.D. Bishop of Washington. New York: The Bishop's Office, 1923. An Emergency Involving the Holy Sepulchre and Other Sacred Places in the Holy Land: A Statement by the American Committee on Preservation of the Sacred Places in the Holy Land. New York: American Committee, 1923. In the Cathedral of St. John the Divine Thanksgiving Day November 25, 1926. The Anglican Church and Its Mission to the Whole Church of Christ: A Message to Old York from New York Delivered in York Minster, England at the 1300th Anniversary of the founding of the Minster on the Morning of the Third Sunday after Trinity July 3, 1927. New York: no publisher, 1927. Morgan Dix, Priest and Doctor: A Sermon Preached by William T. Manning, Bishop of New York in Trinity Church at the Service Commemorating the One Hundredth Anniversary of the Birth of Dr. Dix. November 6, 1927. The Pilgrims: Speeches at a Dinner. The General Convention, the Thirty-Nine Articles and the Obligations of the Ministry. [New York:] no publisher, . Letter to the Rector, Churchwardens and Vestrymen of St. George's Church, New York, in Regard to the Proposed Service at the Meeting of the Christian Unity League. New York: The Diocese of New York, 1929. What the New Prayer Book Ought to Mean to Us. A Sermon Preached in the Cathedral of Saint John the Divine, Advent Sunday, 1929. The Apostolic Ministry: Sermon preached by the Right Reverend William Thomas Manning at the Consecration of the Reverend Charles Kendall Gilbert to be Suffragan Bishop of New York. Cathedral of St. John the Divine Feast of Saint Simon and Saint Jude Tuesday, October 28th 1930. The Building of the Cathedral and What It Means to Our City and Country. A Sermon preached in the Cathedral of St. John the Divine Sunday Oct. 5th, 1930. A Message to the Diocese on Certain Issues Now before Us and on the Meaning of So Called "Companionate Marriage"
Cathedral of St. John the Divine on Sunday, December 7th, 1930. 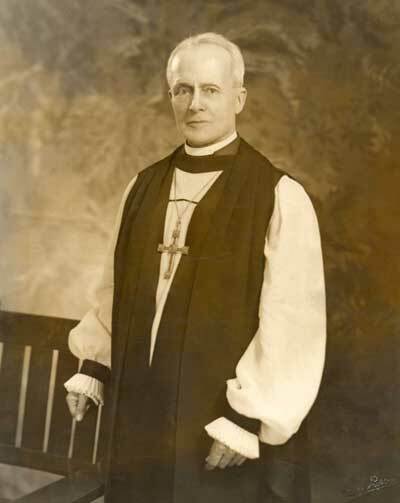 Address by the Right Reverend William T. Manning at the Service of Prayer and Supplication in the Cathedral of St. John the Divine Sunday, March 16th, 1930. Address by Bishop Manning at the Service in the Cathedral of St. John the Divine New York for the Presentation of the Gift from the Native Women of Fort Yukon, Alaska, Sunday February 8, 1931. New York: no publisher, 1931. Sermon Preached by the Right Reverend William T. Manning, D.D. Bishop of New York at All Souls Church St. Nicholas Ave. and 114th St. New York Sunday, October Twenty-third 1932. At the Catholic Congress in Philadelphia Thursday, October 26, 1933. A Sermon by the Right Reverend William T. Manning, D.D., Bishop of New York at the Service in observance of the Centennial Anniversary of the Oxford Movement held at the Stadium, Chicago on the Feast of St. Michael and All Angels, 1933. Henry Codman Potter, Seventh Bishop of New York: A Sermon at the Commemoration of the Fiftieth Anniversary of the Consecration of Bishop Potter, Preached in Grace Church by William Thomas Manning, Tenth Bishop of New York, Sunday, October 22, 1933. New York: Publisher by request, 1933. The Call of This Present Time to the Anglican Communion throughout the World. A sermon preached at the Opening Service of the General Synod of the Church of England in Canada in Christ Church Cathedral, Montreal, Wednesday, September 12, 1934. The Gift of the Episcopate to the Church in America. A sermon preached at the General Convention in Atlantic City, New Jersey, on Sunday, October 21, 1934, at the Service in commemoration of the Consecration of Samuel Seabury as the First Bishop of the Church in America. Address by Bishop Manning at the Regional Conference of the Catholic Congress in Commemoration of the Consecration of Bishop Seabury at St. Peter's Church, Westchester, November 14, 1934. A Charge to the Diocese of New York on the Observance of Lent and the Forward Movement. The Outbreak of War in Ethiopia. A Sermon by William Thomas Manning Bishop of New York preached in the Cathedral of St. John the Divine Sunday, October 6th, 1935. In the Cathedral of St. John the Divine Sunday, December 13th, 1936. The Proposed Concordat between the Protestant Episcopal Church and the Presbyterian Church in the U.S.A. Extract from a Sermon by the Right Reverend William T. Manning Bishop of New York. Preached at the Philadelphia Divinity School Monday January 8, 1940. The True Purpose of Lent: A Sermon by the Bishop Delivered in the Cathedral of St. John the Divine on Quinquagesima Sunday, February 4th, 1940. New York: no publisher, 1940. Loyalty to the Principles of the Prayer Book. A Portion of the Bishop's Address to the Annual Convention of the Diocese of New York May 13, 1941. Sermon by the Right Rev. William T. Manning, D.D. Bishop of New York at the Opening of the Entire Length of the Cathedral of St. John the Divine on Advent Sunday November 30th, 1941. The Present World Situation and Belief in the Holy Catholic Church with Reference to Present Day Movements for Christian Unity. Preached in the Cathedral of St. John the Divine on Sunday, July 26, 1942. The Message of the Church to Our Nation at War. The Proposed Basic Principles for Merging the Episcopal Church with the Presbyterian Church. Has the General convention power to change, or to set aside, the Apostolic threefold ministry of the Holy Catholic Church? And If these "Basic Principles" were accepted what would the Episcopal Church then be? Sermon preached by the Right Rev. William T. Manning Bishop of New York in the Cathedral of St. John the Divine on Sunday, September 12, 1943. New York: The Diocese of New York, 1943. The Turning of the Tide: A Call to the Church for Truer and Bolder Evangelism. West Park, New York: Holy Cross Press, 1949. By the SPCK and the Church Literature Association, n.d.
New York: The Diocese of New York, no date. Prudently with Power: William Thomas Manning, Tenth Bishop of New York. By William Dudley Foulke Hughes .